Personal lifestyle choices, as well as modern life in America, has influenced people to eat more unhealthy foods and bigger portions while being less active. As a result, millions of Americans are overweight or obese (very overweight)–sadly, leading to disease-prone and shortened lives. Last week, I have shared key understandings surrounding weight gain to underscore how excess weight wreaks havoc with your physical, mental, emotional and internal health – increasing your risk for heart disease, high blood pressure, type 2 diabetes, high cholesterol levels, stroke, liver and gallbladder disease, sleep apnea, respiratory problems, arthritis, joint disease, difficulty in mobility, cancer (with strong links to at least 13 certain cancers); psychological and emotional issues including low self-esteem, anxiety, and, even, depression; as well as a shortened life span. I am encouraging you to make a commitment to lose any excess weight (or to maintain your healthy weight) this year. You may be asking: What is the healthiest way to lose weight or what changes need to be made? Here are key understandings for weight-loss success. It’s no secret that losing weight (and keeping it off) is challenging – but it is possible! Committing yourself to finally losing weight, understanding key points, and making changes to your eating and drinking, physical activity, sleep, and managing stress, and sticking to it, are the keys to success. It is important to find a weight-loss approach you can embrace through the seasons of life. You’re not likely to maintain whatever weight loss you achieve if you then “go off” and revert to old habits. And, when it comes to the subject of diet, everyone has an opinion and there is no shortage of information – some of which make questionable promises. Evaluate diets carefully and it is important to talk with your doctor as you start your weight-loss program. Make sure to share with them your other weight loss efforts – along with any concerns. Be mindful of your daily calorie count. Weight loss experts agree that shedding pounds comes down to a simple formula: calories-in versus calories-out. In other words, if you burn more calories than you take in, you’ll lose weight. Know what your daily calorie count should be–and make balanced, healthy choices to stay within it. Keep a food journal to increase awareness of what you are consuming and where you can improve upon. Meal/snack planning can minimize the consequences of cravings or “in-the-moment” decisions. For example, packing our lunch in advance, as opposed to ordering out when hungry, improves the chances that we will eat more nutritiously. We may be able to avoid the added condiments on ready-made sandwiches (e.g. mayonnaise) or be less likely to consume fried foods (few of us like to eat soggy microwaved French fries) or get that super-sized serving. Change how you view eating and decide to consume foods that contribute to your health in a positive way. While not new, the phrase, “Every time you eat or drink, you are either feeding disease or fighting it” recently emphasized by nutritionist, Heather Morgan — is so true! Every bite and drink you take is either fighting disease or feeding it. And you have the ability to make that decision! YOU have the ability to decide what you put into your body. Watch out for added sugars and refined carbs—sugars and grains that have been stripped of their fibrous, nutritious parts (examples include bread and pasta). They spike blood sugar rapidly, leading to hunger, cravings, and increased food intake a few hours later. And, as a result, they are linked to weight gain and obesity. If you are going to eat carbs, do so, but make sure to eat them with their natural fiber. Eat more fruit and veggies. They are delicious and nutritious, and a healthy alternative to salty, fatty, sugary, and processed foods. Fruit and veggies are also chock-filled with fiber which makes our tummies feel full faster. This can help decrease the amount of food we consume, and, hence, calories. Portion control—how much you eat is critical to any weight loss plan. Portion control is understanding how much a serving size of food is and how many calories a serving contains. Keeping track of what you eat is key to helping you gauge and manage your food portions. You can utilize a journal, calendar, or one of many online tools or apps. Admittedly, measuring and counting everything you eat and drink for the rest of your life can be burdensome and even stressful. Consider doing this long enough to learn what typical serving and portion sizes are. Eat breakfast every day. 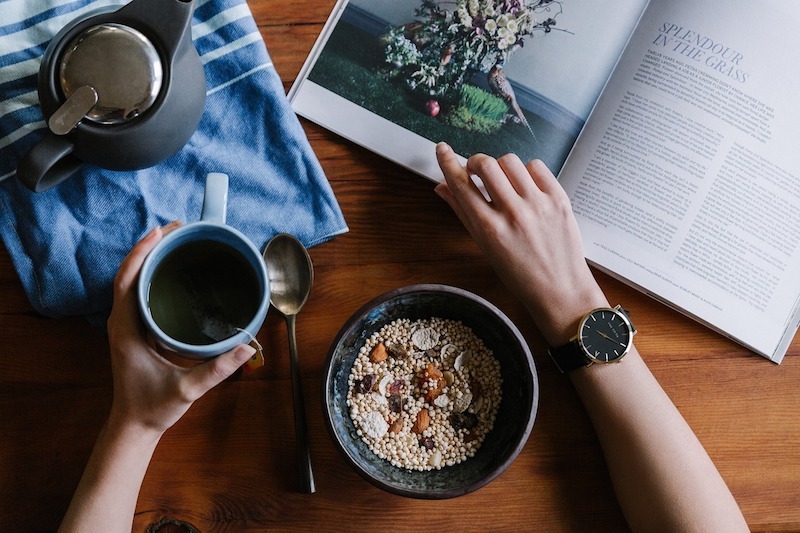 Dubbed the “most important meal of the day,” eating a nutritious breakfast suppresses the release of hunger hormones that would stimulate your appetite and also provides a feeling of fullness. One study showed that dieters who regularly eat breakfast, on average, lose 50 percent more weight than dieters who skip breakfast. Drink plenty of water. Being well-hydrated aids weight loss greatly by supporting your metabolism (the conversion of food to energy, also known as calories burnt), the amount of calories you consume each day, and helping to discern if you are actually hungry or just dehydrated. Try hydrating before you eat so that your tummy fills up with water and you are less likely to reach for a second or third helping. Build muscle! Our muscles are very metabolically active—meaning, pound for pound, they burn more calories than fat. They even burn calories while we are sleeping! Talk about being efficient! Snack smart. Eating in between meals can help suppress hunger pangs that can make us ravenous when food is placed in front of us, boost our energy, and help our bodies get the right amount of nutrients. Keeping snacking to less than 200 calories and selecting foods filled with protein, fiber, and other nutrients, can be a tool to maintain an overall healthy lifestyle. Limit or exorcise sugary drinks—soda, juices, and alcohol. Studies show that calories from liquid sugar may be the single most fattening aspect of the modern diet. Research also demonstrates that sugar-sweetened beverages were linked to a 60% increased risk of obesity in children for each daily serving. And, although fruit juices contain fruit, they lack the fiber found in fruit that fills us up or they may have added sugar. Eating with intention and attention—a concept known as mindfulness—can enhance our enjoyment of food allowing us to savor every bite by engaging our senses (smell, sound, texture, taste, and color), help us better choose and consume items that are nutritious, and make eating an intentional act instead of an automatic one (e.g., boredom, stress). Get your ZZZ’s. Loss of sleep can lead to weight gain by causing that hunger hormone—ghrelin—to skyrocket and impair rational decision-making when it comes to what you put in your mouth. A single night of poor sleep can lead to consuming hundreds of extra calories the following day! Unplug. Using computers, television and phones around bedtime may make it more difficult to fall asleep as a result of their artificial light. Optimize kitchen ergonomics. The saying “Out of sight, out of mind” is one we need to follow when it comes to our kitchen countertops. One study looked at the homes of 200 women and found that those who had cereal on their kitchen countertops were, on average, 20 pounds heavier than those who did not. Conversely, women who had a fruit bowl visible weighed approximately 13 pounds less than those who did not. Manage stress. When faced with stress, research shows that your healthy behaviors are the first to go! Overscheduled, fast-paced lives often win over your best intentions and increase cortisol levels and food cravings. Whether it is yoga, meditation, devotion, talking with someone – maintain healthy habits to de-stress. The one commonality that people share in their weight-loss is that they had to make changes in their everyday behaviors. Health experts are quick to note that it takes more than having a slimmer waist as motivation – but your desire to live a longer, healthier life (and to spend more time with those you love) is a successful motivator!! And that is where we started – making a commitment to your best you in 2019!! Healthy weight loss and management is about your commitment to a healthy lifestyle—a balanced diet; exercise; managing stress; getting your sleep and being mindful. The rewards are well worth it! She completed medical school and residency training at UCLA and has served on the medical faculty at The University of Pennsylvania. She is a Board Certified Anesthesiologist. 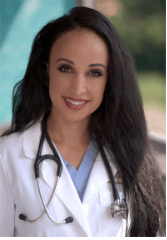 Author of more than 200 textbook chapters, research articles, medical opinions and reviews; she is often called upon by media to speak on medical, fitness, nutrition, and healthy lifestyle topics impacting our lives, today.